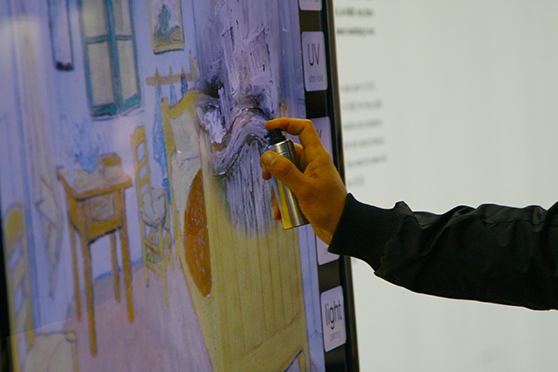 Museum conservators and researchers often take multi-spectral captures of the paintings they study, commonly using x-ray, infrared and ultraviolet equipment. These captures allow them to among others check the condition of the painting, see what type of paint and canvas was used, and sometimes they even discover earlier sketches, drawing aids or completely new paintings underneath the top layer of the paint. Usually these captures are not accessible to the museum visitor, even though they offer valuable information about the painting. 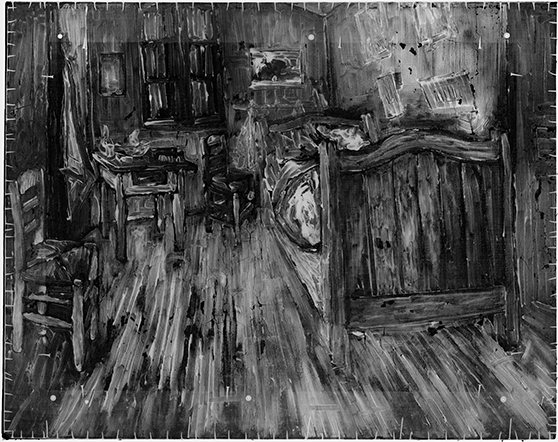 The Van Gogh Museum (Amsterdam, The Netherlands) generously shared their special captures of Van Gogh’s masterpiece ‘The Bedroom’ with the AR Lab, and together with students from the Royal Academy of Art The Hague we developed an installation which allows museum visitors to explore these special captures in an user-friendly and playful way. This installation was made especially for the ‘Van Gogh Friday Evening’ event which took place at the 28th of May 2010, organized by and located at the Van Gogh Museum. We were provided with infrared, ultraviolet and x-ray captures, and also photographs of the back of the painting and photographs with the painting illuminated from the left, right, top and bottom. Together with the students we created a digitally modified spray-can with which the visitor can ‘spray’ on the painting which is displayed on a large screen, temporally revealing the various captures of ‘The Bedroom’. 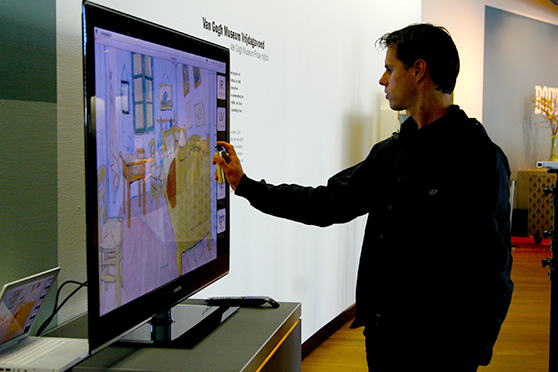 Digital buttons located on the right side of the painting enable the user to choose between the various image captures. Using the opensource ‘Wiimote Whiteboard’ software and a Nintendo Wiimote which is pointing towards the screen we are able to track the position of the infrared light emitting spray-can. We presented this installation on three occasions: at the before mentioned ‘Friday Evening’ event, during the ‘Uitmarkt 2010’ (the largest cultural festival in the Netherlands and the national opening of the cultural season) and at the Stedelijk Museum Amsterdam during their ‘Play It!’ evening which revolved around the latest forms of interactive media art.